A simple cashew ‘ricotta’ cheese filling and rich, hearty spaghetti sauce make this homemade simple vegan cheese manicotti a comforting family dinner! 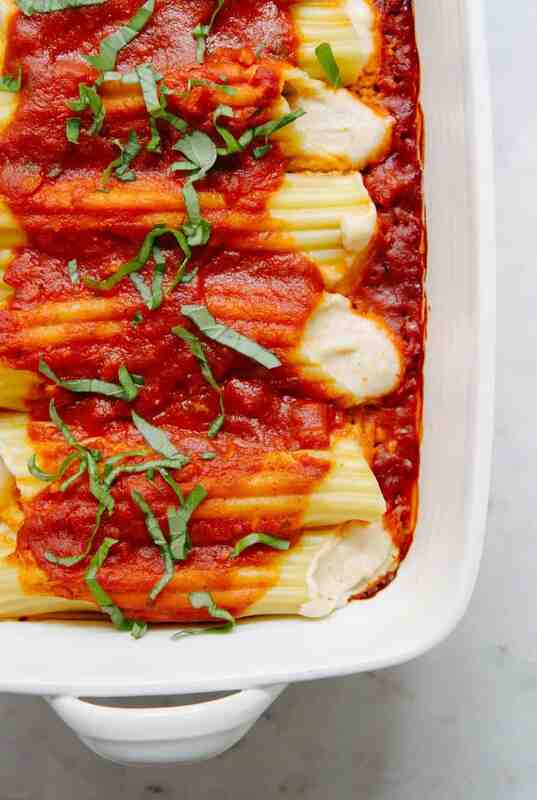 This is a super simple version of manicotti using a cashew ricotta cheese. My daughter used to eat this all the time and so I wanted to recreate this for her. Needless to say she loved it and polished it off. I kept this simple because this is how she likes it…she’s allergic to vegetables I think. ;) Believe me I try…we are opposites but manage to come together on a few things. She’s not vegan with me, she’s 12 and grew up with my old habits and just doesn’t see what I see…one day maybe, or not…it’s a personal decision that we must each make on our own. And don’t forget the sides, this is great served with a sprinkle of Almond Parmesan and chunk of homemade Artisan Bread to wipe up all the sauce. And if you like a salad on the side, this Vegan Caesar Salad would be delicious! If you try this stuffed shells recipe, please let me know! Leave a comment and rate it below. I love to hear what you think, or any changes you make. You can also FOLLOW ME on Facebook, Instagram and Pinterest to see more delicious food and what I’m getting up to. 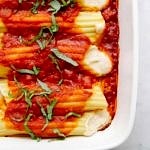 A simple vegan manicotti using cashew ricotta cheese, pasta sauce and fresh basil to top it off. Make your cashew ricotta cheese and keep in the refrigerator until ready to use. Bring a large pot of water to a boil and cook cannelloni shells, about eight minutes. Rinse in cool water and carefully place shells on paper towel to dry. In approx. a 9 x 13 inch baking dish, pour about 3/4 cup pasta sauce onto the bottom. Place ricotta in a large size zip lock bag, let all the air out and seal. Cut a small hole on one bottom corner about 1/4 inch wide. Squeeze ricotta cheese into each tube. Place in baking dish and cover with remaining sauce, add more sauce if desired. Serve with a sprinkle of freshly chopped basil for a bit of color. Feel free to add in fresh chopped basil, chives, spinach, etc. into the ricotta. Roughly chop and incorporate before filling the tubes. You could also try a butternut squash pasta sauce!